Vtirka is a new and budgetary variant of nail design. With her help, you can quickly and inexpensively make a beautiful and modern manicure. Usually it is applied to gel-lacquer, but it will look great on ordinary varnish. To apply a nail polish, you do not need to finish the course or use special equipment. This free-flowing agent is like dust and friable shadows. Its name is due to the way it is applied – rub it gently into the plate with neat movements. Rubbing is absolutely safe for nails and cuticles, it does not cause irritation and allergies, does not spoil from water and sun rays. This tool can be applied to all nails, but more often they are adorned only with the 1-2 finger on the hand. First you need to prepare the plate and cuticle as with a normal manicure, if necessary degrease. 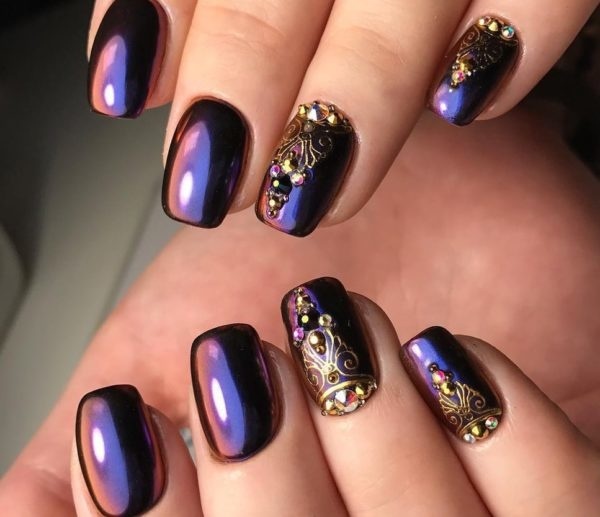 To rub on the nail polish has acquired a deep and rich color, it is better to apply on a dark varnish, for example, black or blue, and paint two not so thin layers. Rubbing for nails on a regular varnish is applied to the surface, which has dried, but has not yet had time to harden. The jar with the pigment is opened neatly and the nail is dropped into a powder. You can also apply the agent on the plate with a sponge or brush. But it is important to remember that the layer should be thick, and the grinding is so fine that it is better to put a stand or any material on the work surface. The powder is rubbed into the fingernail with the fingers of the other hand or sponge, so that the surface becomes perfectly even and smooth. When the rubbing for the nails is completely applied, its remnants are smeared with a clean brush. And then, to make the manicure last longer, apply a fixer. It is important in the first few hours not to use the cream and do not wash your hands.